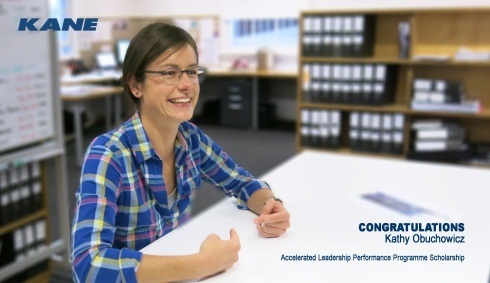 The Directors and Senior Management at Kane would like to congratulate Kathy Obuchowicz on her scholarship to participate in the Accelerated Leadership Performance Programme (ALPP) offered by the Women & Leadership Australia, which supports aspiring women in achieving leadership roles. The program has been specifically developed for emerging and high potential early career and middle-managers with a focus on the behavioural dynamics of leadership. The delivery method is via a combination of one day workshops and short projects across 18 weeks. The program runs from June to November this year. Since joining Kane 18 months ago, Kathy has proven that not only is she capable of winning projects, she’s developed a solid reputation in the NSW construction market and has recently been promoted to Chief Estimator NSW. “I was really excited to have been offered a position in the program, I’m also extremely grateful to receive the scholarship. Through it I hope to gain an understanding of my own personality and behavioural style, to gain new perspectives and improved leadership acumen, to learn from other strong women in industry and enhance my career progression. One key goal to come out of this program would be to inspire women in my team and in other divisions, and to share my enthusiasm for construction. Long term, we could improve the ratio of women in construction in general, across all divisions, not just estimating. All too often I am the only woman in the meeting”. At Kane, it’s our policy to promote and develop management personnel to benefit individuals and the company in order to develop and maintain a high standard of Estimators, Administrators and Project Managers, additionally, we are responsible for the development, mentoring and training of personnel in order to achieve their career goals.